Want to be fit at forty? Don’t have a baby early! Having a family early may not be good for your health later on. That was the conclusion of a team of researchers at the ESRC International centre for Lifecourse Studies when they looked at the interplay between the work and family lives of men and women, whose lives have been tracked over time in the 1958 Birth Cohort Study. But was it the same story for people born earlier and has it been the same for people who were born later? Dr Rebecca Lacey, who led the research, has been looking at the lives of thousands of adults in three Birth Cohort Studies to see whether the way their work and family lives intertwine impacts on the likelihood of them becoming overweight or obese later on. In a recent blog for WorkLife, my colleague Anne McMunn outlined some of our research showing that, for both men and women, having children early, especially as a teenager, was closely linked with poorer health once they got into their forties. Not only did the people we looked at for that piece of research have bigger waists, but they also had a great deal more fat circulating in their blood and less ‘good’ cholesterol, both of which are linked with a heightened risk of heart disease and diabetes. Those findings stayed strong, even for young parents who had a job and were married, a clear indication that having children early on, with all the associated stresses and strains, seems to take a heavy toll on health over the life course. For that piece of research, we looked only at people who had taken part in the National Child Development Study, also known as the 1958 Birth Cohort. For this research we looked, in addition at thousands more people, born in 1946 (National Survey of Health and Development) and another group born in 1970 (the British Cohort Study) whose lives had been tracked since birth. The reason for looking across cohorts was to see whether changes across generations in how we combine work and family (having children later, more cohabitation and less marriage, more women working etc.) have contributed in some way towards poorer health for some. 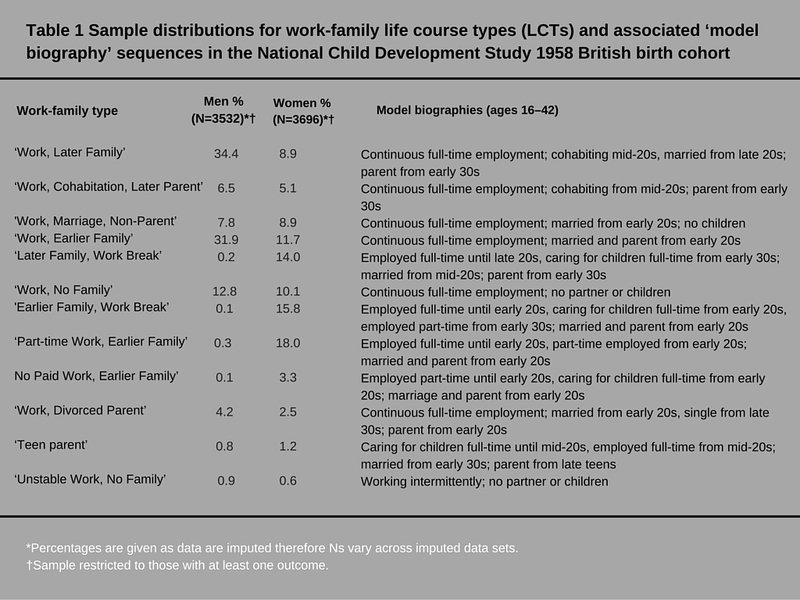 As with the earlier research, we made use of 12 specially created lifecourse types covering information on employment, partnerships and parenthood, such as ‘Work, Later family’ ‘Later family, Work break’, ‘Teen parent’. Each individual in each birth cohort was ascribed a lifecourse type and this was then linked to their Body Mass Index (BMI) and how that changed over time. We went on to see how those figures differed between lifecourse types within and across the three cohorts. We used the World Health Organisation’s (WHO) definition of overweight (BMI greater than or equal to 25) and obesity (BMI greater than or equal to 30). In addition, we took a host of other factors including our participants’ socio-economic background, prior health and educational attainment into consideration. We anticipated that, as our earlier research had shown, that people who worked less and had children earlier would show steeper increases in BMI and that across the three cohorts, those increases would become more pronounced. The distribution of lifecourse types across the three cohorts reflected, as we thought it would, changing attitudes and behaviours across generations, with increasingly more women in employment and early parenthood becoming less and less common. In the 1946 cohort, the average BMI of a very small group of men who were ‘Teen parents’ increased from 20.3 to 26.76 between age 16-42, significantly more than any other work-family combination. The same was true for male teen parents in the 1958 cohort and also for those who worked and had a family early. In the 1970 cohort, men who had no children or had children later had BMI that increased significantly less than those who became parents earlier. The only exception to this was a group of men with no family and unstable work. Another notable finding across all three cohorts was that average BMIs for men at age 42 in all of the work-family groups were higher than the WHO threshold for overweight. The only exception was men who had children later or no children at all. For women in the 1946 study, there was no real difference between the groups when we looked at how their BMI increased between the ages of 16 and 42. The average BMI of the 1958 cohort women who had children early increased significantly more than that of women who had them later. Women in the 1970 cohort who did not work and had children early had the biggest BMI rise (6.69) with teen parents (6.31) close behind. The average BMI of the 42 year-old women in these two groups was on the WHO obesity threshold (30), with the average BMI for the remaining work-family groups all falling under the WHO definition of overweight (25 and above). This research reinforces what we found earlier, which is that for both men and women having children early (especially in your teens) no matter what your background, is likely to have a negative impact on your health in mid life, especially if you don’t have a job or if your work is irregular or unstable. Looking across three cohorts, we can also see that those differences have become more pronounced. How to explain and better understand how all this plays out in the day to day lives of younger parents is a challenge. Having children early may disrupt someone’s education or career. Younger parents may also be more likely to smoke and drink and exercise less than their older counterparts, unhealthy behaviours which can become established early and set in across adulthood. Whatever the context and the reasons, there are some important messages here for young people, prospective parents, health and education professionals as well as for Government; not least that decisions about how to combine work and family life, especially when to become a parent, may have long lasting ramifications for your health. This research adds to a growing body of evidence which makes it clear that, as far as obesity is concerned, early intervention is key and that we need to consider the complex way in which our biological and social lives intertwine over time. Work-family life courses and BMI trajectories in three British birth cohorts is research by Rebecca Lacey, Amanda Sacker, Steven Bell, Meena Kumari, Diana Worts, Peggy McDonough, Diana Kuh, and Anne McMunn. It is published in the International Journal of Obesity. This entry was posted in Journal article and tagged 1946 Birth Cohort, 1958 Birth Cohort, 1970 Birth Cohort, Ageing, Alcohol, BMI, Body fat, Career, Childcare, Children, Divorce, Employment, Family, Health, Heart Disease, Jobseekers, Marriage, Mothers, Obesity, Smoking, Teen Parent, Unemployment, Well-being, Work on December 1, 2016 by Chris Garrington. Being employed is generally good for your health. That’s what a large body of research has shown over the years. But what about when you put having a family into the mix? That’s a question that Dr Anne McMunn at the ESRC International Centre for Lifecourse Studies at UCL has been asking in a series of studies looking at the interplay between work-family life and health in middle age. Here she outlines her findings and explains why having children early may not be good for you. When couples think about starting a family, they may make decisions around a host of concerns. Finances, careers, childcare all spring readily to mind as things that could crop up in discussions about when it might be best to have a child. Not many people will stop and think about how and when having a child might affect their health later on in life – but maybe they should. Research to date has shown that combining paid work with family responsibilities is usually linked with better health outcomes, although existing research has a number of shortcomings: men are often excluded, health measures have tended to be self-reported rather than objective, few studies take account of the role health plays in whether or not people work, get married and have children in the first place, and, crucially, few studies look across the lifecourse at the timings of entry into parenthood. Using the National Child Development Study, which is following the lives of 17 thousand people born in 1958, our research has looked at how they combined their work and family lives between the ages of 16 and 42 and what that meant for their health in their mid 40s. The thinking behind the research was that those people with more stressful work-family lives (often characterised by having children very young, being unemployed, and not marrying or forming a long-term partnership) would go on to have physical signs or indicators of poor health such as high cholesterol and blood pressure, being overweight etc. All the men and women in the study were ascribed one of 12 lifecourse types e.g. ‘Work, Later family’, ‘Later family, Work break’, ‘Teen parent’. Almost all men were in a group characterised by long-term full-time employment, with most (34%) entering family life later (the ‘Work, Later family’ group), with nearly as many entering family life earlier (the ‘Work, Earlier family’ group at 32%). Conversely fewer than half of women (47%) were in a group characterised by long-term full-time employment. The ‘Part-time work, Earlier Family’ was the most common group (18%) for women. Similar proportions of men and women were in the ‘Work, Cohabitation, Later Parent’ group (7% and 5%, respectively), the ‘Work, Marriage, Non-Parent’ group (8% of men, 9% of women) and the ‘Work, No Family’ group (13% of men, 10% of women). Only 4% of women were in the ‘No Paid Work, Earlier Family’ group, and few men or women were in groups characterised by marital dissolution, teen parenthood or weak ties to work or family. As we expected, those men and women who were in full-time long-term employment, were married and had children later on enjoyed better health. Early parenthood, especially teen parenthood was clearly linked to poorer health, regardless of whether they were in paid work or in a stable long-term marriage. For example, the waist circumference of teen parents was four inches larger, on average, than those who were in full-time long-term employment, were married and had children later (fat accumulated around the waistline is known to be particularly risky for health). Groups who entered parenthood earlier had 10-18% more fat circulating in the blood and 2-8% less of the ‘good’ HDL cholesterol than those who were in full-time long-term employment, were married and had children later. Teen parents tended to be less well educated, which accounted for some of the link. However, even those who had stable employment and marriages, but had children early, had poorer health. It seems that for both men and women, having children early is linked with poor health later on, possibly as a result of chronic stress from parenting in straitened circumstances with fewer financial and emotional resources. Authors of other studies showing links between early parenthood and health problems such as depression, heart disease and long term illnesses, speculate that younger parents have accumulated less human and social capital to cope with the stresses of parenting. It is also possible that those who are older when they become parents have had time to establish healthier behaviours such as exercise and healthy eating prior to starting their families, making it easier to maintain those behaviours through the busy parenting years. There is need for further evidence on how timing of parenthood influences health and we are currently replicating this study with participants from the 1970 birth cohort. In the meantime, perhaps those family planning discussions around finances, careers and childcare should incorporate an extra question? If we have a child now rather than later, how might it affect our health later on? It’s a question that will be of interest not just to prospective parents, but to all those concerned with improving the long term health and well-being of our society. Work-family life courses and metabolic markers in mid-life: evidence from the British National Child Development Study is research by Anne McMunn, Rebecca E Lacey, Meena Kumari, Diana Worts, Peggy McDonough and Amanda Sacker. This entry was posted in Journal article, Research report and tagged 1958 Birth Cohort, Blood pressure, BMI, Career, Childcare, Cholesterol, Employment, Family, Fathers, Health, Heart Disease, Mothers, Teen Parent, Unemployment, Well-being, Work on August 8, 2016 by Chris Garrington. Inflammation can be good and bad for us. Find out more in this presentation from researcher Rebecca Lacey, who uses inflammatory markers in mid life to look at whether the way in which we combine our work and family lives early on affects our health later on. The research, presented at an ESRC International Centre for Lifecourse Studies policy seminar, concludes that homemakers and people who have children early, particularly teen parents, are at greater risk of poor health in mid life and recommends increased support and opportunities for young parents. Listen to Rebecca’s presentation and view the slides below. Work, family and health – a question of inflammation? from Chris Garrington on Vimeo. This entry was posted in Presentation and tagged 1958 Birth Cohort, C Reactive Protein, Career, Childcare, Employment, Family, Fibrinogen, Flexible working, Health, Heart Disease, Inflammation, Lone Parent, Mothers, Teen Parent, Unemployment, Von Willebrand factor, Work on May 3, 2016 by Chris Garrington.